"Carborundum" redirects here. It is not to be confused with Corundum. 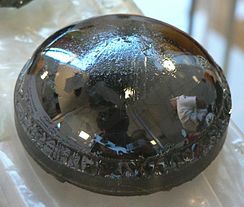 Silicon carbide (SiC), also known as carborundum /kɑːrbəˈrʌndəm/, is a semiconductor containing silicon and carbon. It occurs in nature as the extremely rare mineral moissanite. Synthetic SiC powder has been mass-produced since 1893 for use as an abrasive. Grains of silicon carbide can be bonded together by sintering to form very hard ceramics that are widely used in applications requiring high endurance, such as car brakes, car clutches and ceramic plates in bulletproof vests. Electronic applications of silicon carbide such as light-emitting diodes (LEDs) and detectors in early radios were first demonstrated around 1907. SiC is used in semiconductor electronics devices that operate at high temperatures or high voltages, or both. Large single crystals of silicon carbide can be grown by the Lely method and they can be cut into gems known as synthetic moissanite. Silicon-infiltrated carbon-carbon composite is used for high performance "ceramic" brake disks, as they are able to withstand extreme temperatures. The silicon reacts with the graphite in the carbon-carbon composite to become carbon-fiber-reinforced silicon carbide (C/SiC). 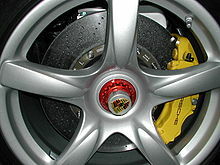 These brake disks are used on some road-going sports cars, supercars, as well as other performance cars including the Porsche Carrera GT, the Bugatti Veyron, the Chevrolet Corvette ZR1, the McLaren P1, Bentley, Ferrari, Lamborghini and some specific high-performance Audi cars. Silicon carbide is also used in a sintered form for diesel particulate filters. It's also used as an oil additive to reduce friction, emissions, and harmonics. Test flame and glowing SiC fibers. The flame is about 7 cm (2.8 in) tall. Silicon carbide composite material has been investigated for use as a replacement for Zircaloy cladding in light water reactors. One of the reasons for this investigation is that, Zircaloy experiences hydrogen embrittlement as a consequence of the corrosion reaction with water. This produces a reduction in fracture toughness with increasing volumetric fraction of radial hydrides. This phenomenon increases drastically with increasing temperature to the detriment of the material. Silicon carbide cladding does not experience this same mechanical degradation, but instead retains strength properties with increasing temperature. The composite consists of SiC fibers wrapped around a SiC inner layer and surrounded by an SiC outer layer. Problems have been reported with the ability to join the pieces of the SiC composite. Silicon carbide can be used in the production of graphene because of its chemical properties that promote the epitaxial production of graphene on the surface of SiC nanostructures. When it comes to its production, silicon is used primarily as a substrate to grow the graphene. But there are actually several methods that can be used to grow the graphene on the silicon carbide. The confinement controlled sublimation (CCS) growth method consists of a SiC chip that is heated under vacuum with graphite. Then the vacuum is released very gradually to control the growth of graphene. This method yields the highest quality graphene layers. But other methods have been reported to yield the same product as well. Another way of growing graphene would be thermally decomposing SiC at a high temperature within a vacuum. But this method turns out to yield graphene layers that contain smaller grains within the layers. So there have been efforts to improve the quality and yield of graphene. One such method is to perform ex situ graphitization of silicon terminated SiC in an atmosphere consisting of argon. This method has proved to yield layers of graphene with larger domain sizes than the layer that would be attainable via other methods. This new method can be very viable to make higher quality graphene for a multitude of technological applications. When it comes to understanding how or when to use these methods of graphene production, most of them mainly produce or grow this graphene on the SiC within a growth enabling environment. It is utilized most often at rather higher temperatures (such as 1300˚C) because of SiC thermal properties. However, there have been certain procedures that have been performed and studied that could potentially yield methods that use lower temperatures to help manufacture graphene. More specifically this different approach to graphene growth has been observed to produce graphene within a temperature environment of around 750˚C. This method entails the combination of certain methods like chemical vapor deposition (CVD) and surface segregation. And when it comes to the substrate, the procedure would consist of coating a SiC substrate with thin films of a transition metal. And after the rapid heat treating of this substance, the carbon atoms would then become more abundant at the surface interface of the transition metal film which would then yield graphene. And this process was found to yield graphene layers that were more continuous throughout the substrate surface. Silicon carbide can host point defects in the crystal lattice which are known as color centers. These defects can produce single photons on demand and thus serve as a platform for single-photon source. Such a device is a fundamental resource for many emerging applications of quantum information science. If one pumps a color center via an external optical source or electrical current, the color center will be brought to the excited state and then relax with the emission of one photon. One well known point defect in silicon carbide is the divacancy which has a similar electronic structure as the nitrogen-vacancy center in diamond. In 4H-SiC, the divacancy has four different configurations which correspond to four zero-phonon lines (ZPL). These ZPL values are written using the notation VSi-VC and the unit eV: hh(1.095), kk(1.096), kh(1.119), and hk(1.150). ^ a b c d NIOSH Pocket Guide to Chemical Hazards. "#0555". National Institute for Occupational Safety and Health (NIOSH). ^ a b Haynes, William M., ed. (2011). CRC Handbook of Chemistry and Physics (92nd ed.). Boca Raton, FL: CRC Press. p. 4.88. ISBN 1439855110. ^ Pubchem. "Silicon carbide". pubchem.ncbi.nlm.nih.gov. Retrieved 2018-11-27. ^ Haynes, William M., ed. (2011). CRC Handbook of Chemistry and Physics (92nd ed.). Boca Raton, FL: CRC Press. p. 4.135. ISBN 1439855110. ^ a b c "Properties of Silicon Carbide (SiC)". Ioffe Institute. Retrieved 2009-06-06. ^ Weimer, A. W. (1997). Carbide, nitride, and boride materials synthesis and processing. Springer. p. 115. ISBN 978-0-412-54060-8. ^ Acheson, G. (1893) U.S. Patent 492,767 "Production of artificial crystalline carbonaceous material"
^ "The Manufacture of Carborundum- a New Industry". Scientific American. April 7, 1894. Archived from the original on January 23, 2009. Retrieved 2009-06-06. ^ Mabery, Charles F. (1900). "Notes, On Carborundum". Journal of the American Chemical Society. XXII (Part II): 706–707. doi:10.1021/ja02048a014. Retrieved 2007-10-28. ^ Hart, Jeffrey A.; Stefanie Ann Lenway; Thomas Murtha. "A History of Electroluminescent Displays". ^ Moissan, Henri (1904). "Nouvelles recherches sur la météorité de Cañon Diablo". Comptes rendus. 139: 773–86. ^ Di Pierro S.; Gnos E.; Grobety B.H. ; Armbruster T.; Bernasconi S.M. & Ulmer P. (2003). "Rock-forming moissanite (natural α-silicon carbide)". American Mineralogist. 88 (11–12): 1817–21. doi:10.2138/am-2003-11-1223. ^ Kelly, Jim. "The Astrophysical Nature of Silicon Carbide". University College London. Archived from the original on May 4, 2017. Retrieved 2009-06-06. ^ Vlasov, A.S.; et al. (1991). "Obtaining silicon carbide from rice husks". Refractories and Industrial Ceramics. 32 (9–10): 521–523. doi:10.1007/bf01287542. ^ Zhong, Y.; Shaw, Leon L.; Manjarres, Misael & Zawrah, Mahmoud F. (2010). "Synthesis of Silicon Carbide Nanopowder Using Silica Fume". Journal of the American Ceramic Society. 93 (10): 3159–3167. doi:10.1111/j.1551-2916.2010.03867.x. ^ a b c Harris, Gary Lynn (1995). Properties of silicon carbide. IET. p. 19; 170–180. ISBN 978-0-85296-870-3. ^ Lely, Jan Anthony (1955). "Darstellung von Einkristallen von Silicium Carbid und Beherrschung von Art und Menge der eingebauten Verunreinigungen". Berichte der Deutschen Keramischen Gesellschaft. 32: 229–236. ^ Lely SiC Wafers. Nitride-crystals.com. Retrieved on 2013-05-04. ^ Ohtani, N.; et al. (2001). Nippon Steel Technical Report no. 84 : Large high-quality silicon carbide substrates (PDF). Archived from the original (PDF) on 2010-12-17. ^ Byrappa, K.; Ohachi, T. (2003). Crystal growth technology. Springer. pp. 180–200. ISBN 978-3-540-00367-0. ^ Bakin, Andrey S. (2006). "SiC Homoepitaxy and Heteroepitaxy". In M. Shur; S. Rumyantsev; M. Levinshtein. SiC materials and devices. 1. World Scientific. pp. 43–76. ISBN 978-981-256-835-9. ^ a b Park, Yoon-Soo (1998). SiC materials and devices. Academic Press. pp. 20–60. ISBN 978-0-12-752160-2. ^ Pitcher, M. W.; Joray, S. J.; Bianconi, P. A. (2004). "Smooth Continuous Films of Stoichiometric Silicon Carbide from Poly(methylsilyne)". Advanced Materials. 16 (8): 706–709. doi:10.1002/adma.200306467. ^ Bunsell, A. R.; Piant, A. (2006). "A review of the development of three generations of small diameter silicon carbide fibres". Journal of Materials Science. 41 (3): 823–839. Bibcode:2006JMatS..41..823B. doi:10.1007/s10853-006-6566-z. ^ Laine, Richard M.; Babonneau, Florence (1993). "Preceramic polymer routes to silicon carbide". Chemistry of Materials. 5 (3): 260–279. doi:10.1021/cm00027a007. ^ Cheung, Rebecca (2006). Silicon carbide microelectromechanical systems for harsh environments. Imperial College Press. p. 3. ISBN 978-1-86094-624-0. ^ Morkoç, H.; Strite, S.; Gao, G. B.; Lin, M. E.; Sverdlov, B.; Burns, M. (1994). "Large-band-gap SiC, III-V nitride, and II-VI ZnSe-based semiconductor device technologies". Journal of Applied Physics. 76 (3): 1363. Bibcode:1994JAP....76.1363M. doi:10.1063/1.358463. ^ a b Muranaka, T.; Kikuchi, Yoshitake; Yoshizawa, Taku; Shirakawa, Naoki; Akimitsu, Jun (2008). "Superconductivity in carrier-doped silicon carbide". Sci. Technol. Adv. Mater. 9 (4): 044204. Bibcode:2008STAdM...9d4204M. doi:10.1088/1468-6996/9/4/044204. PMC 5099635. PMID 27878021. ^ Silicon Carbide. Thermal properties. Ioffe Institute Semiconductors Database. ^ a b Bhatnagar, M.; Baliga, B.J. (March 1993). "Comparison of 6H-SiC, 3C-SiC, and Si for power devices". IEEE Transactions on Electron Devices. 40 (3): 645–655. Bibcode:1993ITED...40..645B. doi:10.1109/16.199372. ^ Kriener, M.; Muranaka, Takahiro; Kato, Junya; Ren, Zhi-An; Akimitsu, Jun; Maeno, Yoshiteru (2008). "Superconductivity in heavily boron-doped silicon carbide". Sci. Technol. Adv. Mater. 9 (4): 044205. arXiv:0810.0056. Bibcode:2008STAdM...9d4205K. doi:10.1088/1468-6996/9/4/044205. PMC 5099636. PMID 27878022. ^ Yanase, Y. & Yorozu, N. (2008). "Superconductivity in compensated and uncompensated semiconductors". Sci. Technol. Adv. Mater. 9 (4): 044201. Bibcode:2008STAdM...9d4201Y. doi:10.1088/1468-6996/9/4/044201. PMC 5099632. PMID 27878018. ^ Bansal, Narottam P. (2005). Handbook of ceramic composites. Springer. p. 312. ISBN 978-1-4020-8133-0. ^ "Production of Silicon Carbide". siliconcarbide.net. ^ "Ceramics for turbine engines". unipass.com. Archived from the original on 2009-04-06. Retrieved 2009-06-06. ^ "Dragon Skin – Most Protective Body Armor – Lightweight". Future Firepower. Archived from the original on 2012-04-24. Retrieved 2009-06-06. ^ "Silicon Carbide". Ceramic Arts Daily. ^ "Top 10 Fast Cars". topmost10.com. Archived from the original on 2009-03-26. Retrieved 2009-06-06. ^ O'Sullivan, D.; Pomeroy, M.J.; Hampshire, S.; Murtagh, M.J. (2004). "Degradation resistance of silicon carbide diesel particulate filters to diesel fuel ash deposits". MRS Proceedings. 19 (10): 2913–2921. Bibcode:2004JMatR..19.2913O. doi:10.1557/JMR.2004.0373. ^ Studt, P. (1987). "Influence of lubricating oil additives on friction of ceramics under conditions of boundary lubrication". Wear. 115 (1–2): 185–191. doi:10.1016/0043-1648(87)90208-0. ^ Brown, John (1999). Foseco Non-Ferrous Foundryman's Handbook. Butterworth-Heinemann. pp. 52–. ISBN 978-0-08-053187-8. ^ Whitaker, Jerry C. (2005). The electronics handbook. CRC Press. p. 1108. ISBN 978-0-8493-1889-4. ^ Bayliss, Colin R. (1999). Transmission and distribution electrical engineering. Newnes. p. 250. ISBN 978-0-7506-4059-6. ^ Chen, H.; Raghothamachar, Balaji; Vetter, William; Dudley, Michael; Wang, Y.; Skromme, B. J. (2006). "Effects of defect types on the performance of devices fabricated on a 4H-SiC homoepitaxial layer". Mater. Res. Soc. Symp. Proc. 911: 169. doi:10.1557/PROC-0911-B12-03. ^ Madar, Roland (2004-08-26). "Materials science: Silicon carbide in contention". Nature. 430 (7003): 974–975. Bibcode:2004Natur.430..974M. doi:10.1038/430974a. PMID 15329702. ^ Chen, Z.; Ahyi, A. C.; Zhu, X.; Li, M.; Isaacs-Smith, T.; Williams, J. R.; Feldman, L. C. (2010). "MOS Characteristics of C-Face 4H-SiC". J. Of Elec. Mat. 39 (5): 526–529. Bibcode:2010JEMat..39..526C. doi:10.1007/s11664-010-1096-5. ^ Meißer, Michael (2013). Resonant Behaviour of Pulse Generators for the Efficient Drive of Optical Radiation Sources Based on Dielectric Barrier Discharges. KIT Scientific Publishing. p. 94. ISBN 978-3-7315-0083-4. ^ Horio, Masafumi; Iizuka, Yuji; Ikeda, Yoshinari (2012). "Packaging Technologies for SiC Power Modules" (PDF). Fuji Electric Review. 58 (2): 75–78. ^ Klipstein, Don. "Yellow SiC LED". Retrieved 2009-06-06. ^ a b Stringfellow; Gerald B. (1997). High brightness light emitting diodes. Academic Press. pp. 48, 57, 425. ISBN 978-0-12-752156-5. ^ "The largest telescope mirror ever put into space". European Space Agency. Retrieved 2009-06-06. ^ Maun, Jignesh D.; Sunderland, P. B.; Urban, D. L. (2007). "Thin-filament pyrometry with a digital still camera". Applied Optics. 46 (4): 483–8. Bibcode:2007ApOpt..46..483M. doi:10.1364/AO.46.000483. PMID 17230239. ^ Deshmukh, Yeshvant V. (2005). Industrial heating: principles, techniques, materials, applications, and design. CRC Press. pp. 383–393. ISBN 978-0-8493-3405-4. ^ López-Honorato, E.; Tan, J.; Meadows, P. J.; Marsh, G.; Xiao, P. (2009). "TRISO coated fuel particles with enhanced SiC properties". Journal of Nuclear Materials. 392 (2): 219–224. Bibcode:2009JNuM..392..219L. doi:10.1016/j.jnucmat.2009.03.013. ^ Bertolino, Meyer, G. (2002). "Degradation of the mechanical properties of Zircaloy-4 due to hydrogen embrittlement". Journal of Alloys and Compounds. 330-332: 408–413. doi:10.1016/S0925-8388(01)01576-6. ^ Carpenter, David; Ahn, K.; Kao, S.P. ; Hejzlar, Pavel; Kazimi, Mujid S. "Assessment of Silicon Carbide Cladding for High Performance Light Water Reactors". Nuclear Fuel Cycle Program, Volume MIT-NFC-TR-098 (2007). Archived from the original on 2012-04-25. Retrieved 2011-10-13. ^ Ames, Nate (June 17, 2010). "SiC Fuel Cladding". Nuclear Fabrication Consortium, nuclearfabrication.org. Archived from the original on April 25, 2012. Retrieved 2011-10-13. ^ O'Donoghue, M. (2006). Gems. Elsevier. p. 89. ISBN 978-0-7506-5856-0. ^ "Silicon carbide (steel industry)". Archived from the original on 2012-02-04. Retrieved 2009-06-06. ^ Rase, Howard F. (2000). Handbook of commercial catalysts: heterogeneous catalysts. CRC Press. p. 258. ISBN 978-0-8493-9417-1. ^ Singh, S. K.; Parida, K. M.; Mohanty, B. C.; Rao, S. B. (1995). "High surface area silicon carbide from rice husk: A support material for catalysts". Reaction Kinetics and Catalysis Letters. 54 (1): 29–34. doi:10.1007/BF02071177. ^ "Printmaking". Bircham Gallery, birchamgallery.co.uk. Retrieved 2009-07-31. ^ Ruan, Ming; Hu, Yike; Guo, Zelei; Dong, Rui; Palmer, James; Hankinson, John; Berger, Claire; Heer, Walt A. de (December 2012). "Epitaxial graphene on silicon carbide: Introduction to structured graphene". MRS Bulletin. 37 (12): 1138–1147. doi:10.1557/mrs.2012.231. ISSN 0883-7694. ^ Emtsev, Konstantin V.; Bostwick, Aaron; Horn, Karsten; Jobst, Johannes; Kellogg, Gary L.; Ley, Lothar; McChesney, Jessica L.; Ohta, Taisuke; Reshanov, Sergey A. (2009-02-08). "Towards wafer-size graphene layers by atmospheric pressure graphitization of silicon carbide". Nature Materials. 8 (3): 203–207. doi:10.1038/nmat2382. ISSN 1476-1122. ^ de Heer, Walt A.; Berger, Claire; Wu, Xiaosong; First, Phillip N.; Conrad, Edward H.; Li, Xuebin; Li, Tianbo; Sprinkle, Michael; Hass, Joanna (July 2007). "Epitaxial graphene". Solid State Communications. 143 (1–2): 92–100. doi:10.1016/j.ssc.2007.04.023. ISSN 0038-1098. ^ Juang, Zhen-Yu; Wu, Chih-Yu; Lo, Chien-Wei; Chen, Wei-Yu; Huang, Chih-Fang; Hwang, Jenn-Chang; Chen, Fu-Rong; Leou, Keh-Chyang; Tsai, Chuen-Horng (2009-07-01). "Synthesis of graphene on silicon carbide substrates at low temperature". Carbon. 47 (8): 2026–2031. doi:10.1016/j.carbon.2009.03.051. ISSN 0008-6223. ^ Lohrmann, A.; Iwamoto, N.; Bodrog, Z.; Castalletto, S.; Ohshima, T.; Karle, T.J.; Gali, A.; Prawer, S.; McCallum, J.C.; Johnson, B.C. (2015). "Single-photon emitting diode in silicon carbide". Nature Communications. 6: 7783. arXiv:1503.07566. Bibcode:2015NatCo...6E7783L. doi:10.1038/ncomms8783. ^ Khramtsov, I.A. ; Vyshnevyy, A.A.; Fedyanin, D. Yu. (2018). "Enhancing the brightness of electrically driven single-photon sources using color centers in silicon carbide". Npj Quantum Information. 4: 15. Bibcode:2018npjQI...4...15K. doi:10.1038/s41534-018-0066-2. ^ Davidsson, J.; Ivády, V.; Armiento, R.; Son, N.T. ; Gali, A.; Abrikosov, I. A. (2018). "First principles predictions of magneto-optical data for semiconductor point defect identification: the case of divacancy defects in 4H–SiC". New Journal of Physics. 20 (2): 023035. doi:10.1088/1367-2630/aaa752.